It's that time of the year again, when streets of Mumbai are filled with lights, sounds of dhol-taasha and enthusiasm. The whiff of freshly made modaks and puranpolis is hard to miss, while markets are packed with people bargaining for the best deal on fresh flowers. Everybody's favourite, the adorable 'Lord Ganesha', makes his away into homes and pandals for a period of 11 blissful days. Ganesh Utsav, as the festival is popularly known as, starts on the fourth day of the Bhadrapad month in Hindu calendar, and ends on Anant Chaturdashi [fourteenth day] with Lord Ganesha's immersion procession. Mumbai glimmers and shines during these eleven wonderful days, with fairy lights and sounds of peaceful bhajans all around. During this period, several people visit their friends, families and various sarvajanik [public] pandals. While Ganesh Chaturthi has been widely celebrated at homes even before the seventeenth century and was further celebrated on a large scale during the Shivaji Maharaj and Peshwa rule, it was only in 1893 that freedom fighter Lokmanya Tilak popularised Sarvajanik Ganesh Utsav. This was done as the means to unite people from all castes and thus, creating a sense of nationalism among citizens to oppose the British colonial rule. Since then, several mandals took to celebrating Sarvajanik Ganesh Utsav on a large scale, year after year. Over the years, certain mandals have carved their own niche and have become extremely popular. Some are 'wish-fulfilling', while the others are well known for their celebrity attendance, unique decorations, idols and some serious grandeur. 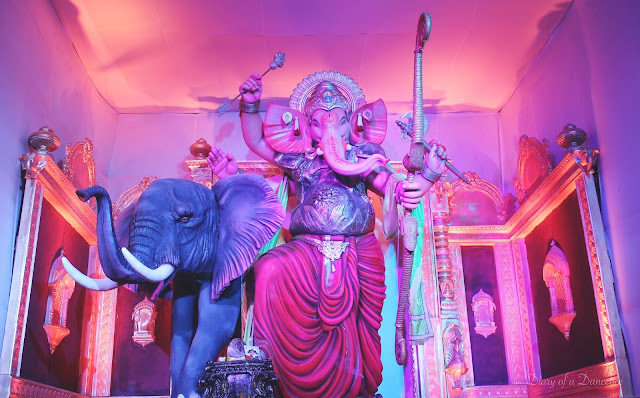 In this post, we give you a round up of some of the most popular Ganesh Pandals in Mumbai, that witness a massive footfall every year. 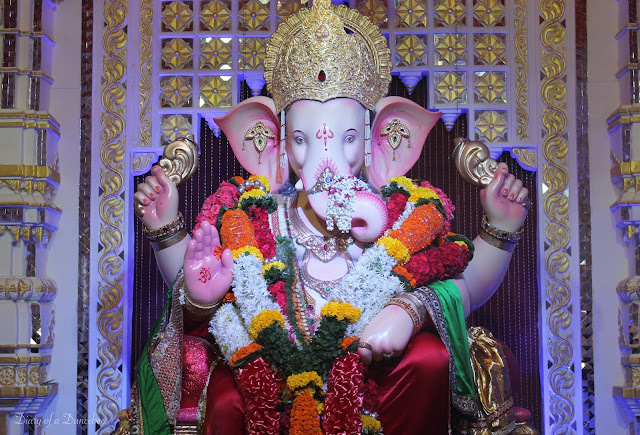 Popularly known as the Mumbai cha Raja or Ganesh Galli ganpati, the Lalbaug Sarvajanik Ganesh Utsav Mandal will enter it's 87th year in 2016. Every year, the mandal plans a special theme for the decor and has also won several awards for the same. This year, one can witness a replica of the famous Badrinath Temple and the massive decor boasts of a 20ft+ dome, which was installed with the help of a crane. The 22+ ft Mumbai cha Raja idol will be seen in a Vishnu avatar, standing atop a huge lotus. The mandal is involved in a variety of charitable causes as well. The highlight of this year is a special tribute, the mandal will invite members from several sections of public services in Maharashtra, including the Fire Brigade unit, nurses at KEM, Postal Department, Police among others, as special guests for the aarti. The mandal witnesses massive footfall every day, with the crowd swelling during the last three days. Known as the 'Navsacha Raja' or 'Wish fulfilling' Ganesha globally, the Lalbaugcha Raja Sarvajanik Ganesh Utsav Mandal is one of the most popular pandals in Mumbai. Started in 1934 because of a vow fulfilled for the creation of the Lalbaug Market, the mandal has now entered it's 82nd year. Lakhs of devotees visit the pandal for a glimpse of the 'Raja' everyday. Devotees whose wish has been fulfilled the previous year opt for the 'Navas' queue, which lasts for close to 24 hours or even more. The pandal is open for darshan 24x7, with celebrities and locals coming in for the special evening aarti everyday. The idol has been sculpted by the Kambli family for the past eight decades. The GSB Sarvajanik Ganesh Utsav Mandal at King's Circle celebrates the festival for a period of five days. This is one of the first mandals to introduce a 'skywalk' darshan facility, for those who need a quick glimpse of the lord. Various pujas are conducted all day long, starting from 6 am onwards and going right up to 11 pm. The special attraction here is the fact that this huge idol is made entirely of clay and is adorned with pure gold, silver jewellery every year. Devotees can also participate in pujas, tulabhar [weighing scale] seva or enjoy the entertainment programmes conducted by folk artists. Do not miss the special bhog prasad [food] which is served to all the devotees post aarti, twice a day. Popularly known as the Andheri cha Raja, the mandal is well known for it's unique temple inspired themes every year. While they celebrated their golden jubilee last year with a monumental replica of the famous Ambaji temple [Gujarat], the decor this year will resemble Konkan's popular Kunkaneshwar Temple [Malvan]. Started in 1966 by blue collared workers of Lalbaug, who had then moved to Andheri, Andheri cha Raja keep their idol for fifteen days and are among the few mandals that immerse the lord on Sankashti Chaturthi i.e four days after Anant Chaturdashi. This mandal too witnesses major footfall and has won several awards for their marvellous decor in the past. 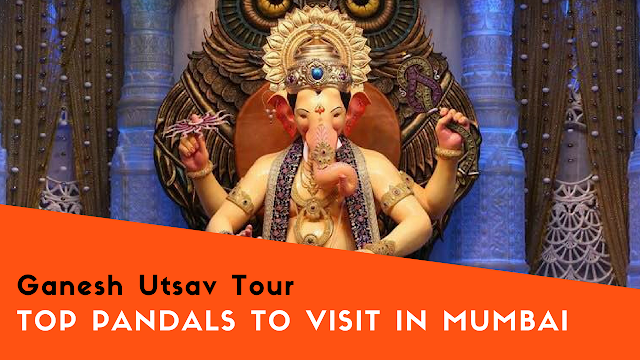 Situated within the Tejukaya chawl premises, the Tejukaya Sarvajanik Ganesh Utsav Mandal has created it's own niche in the past 49 years, thus becoming one of the popular mandals in the area and city. Started by the residents of Tejukaya Chawl in 1967, the unique fact about this mandal is their idol, which is presented in a different avatar every year, with the exact same facial features. 2016 is a special year for the committee and residents of the Tejukaya chawl, as the mandal will celebrate it's Golden Jubilee with a special 22ft idol. One can also see a special dome, massive gate and carved elephant structures that shall be placed on both sides of the entry lane. Since the chawl will also undergo redevelopment later this year [which means the mandal can celebrate their next Ganesh Utsav only once the project is complete], it is truly a special celebration for the residents! 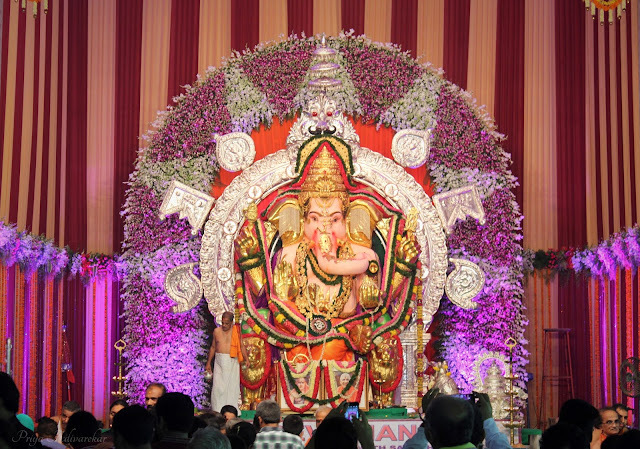 Popularly known as the 'Gold Ganesha', the GSB Sarvajanik Ganesh Utsav Mandal at Wadala celebrates Ganesh Utsav for eleven days, with pujas and special aartis conducted every hour. It is also widely known as one of the first mandals to ensure their idol and all the gold ornaments, which are both created by the trust and donated by devotees. The mandal organises special folk entertainment, with plays, bhajans and dance performances going on all day. The 'Ratri Pooja' or 'Night aarti' should not be missed, as the sounds of traditional instruments and rituals will give you goosebumps [in a good way].